This make-ahead holiday coffee cake is infused with eggnog and rum extract, and topped with a streusel topping and drizzled with an eggnog glaze. Eggnog is one of those things that you either love or hate. For me, I love to drink eggnog and bake with it as well. 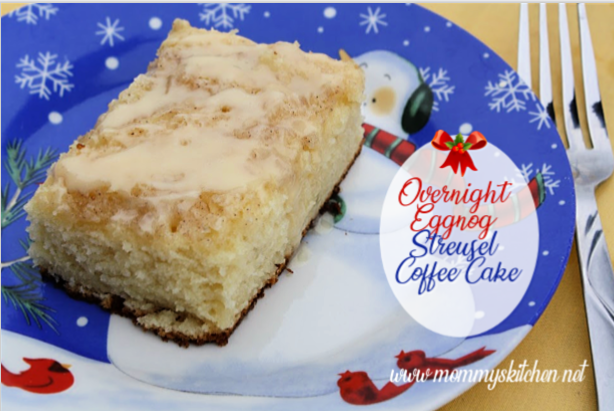 When I saw this recipe for Eggnog Streusel Coffee Cake over at Mandy's Recipe Box, I knew I had to make it! I wanted to make this as part of our Christmas morning breakfast along with a savory breakfast casserole. This festive coffee cake can be prepared the night before and stored in the refrigerator or prepared in the morning. I like to assemble this coffee cake the night before so the flavors have time to blend together. This is a huge time saver for Christmas morning. Once I got my first bite this coffee cake definitely did not disappoint! It was so moist and have a delicious eggnog flavor. Even my little guy who dislikes eggnog said he loved it. I think this recipe will become a holiday favorite in our house. Grease the bottom only of a 13 x 9 x 2 inch baking pan with non stick baking spray. In small bowl, mix all of the streusel topping ingredients together with fork until crumbly; set aside. In large bowl, beat 1 cup granulated sugar and 1/2 cup butter with electric mixer until blended. Beat in 1 cup eggnog, sour cream, rum, butter or vanilla extract, and eggs until blended. Stir in the flour, baking powder, baking soda, and salt. Spread the batter evenly into prepared pan. Sprinkle the streusel topping over the batter. Cover with foil and refrigerate overnight. Pre-heat oven to 350°F. Remove foil; bake 35 to 40 minutes or until toothpick inserted in center comes out clean. 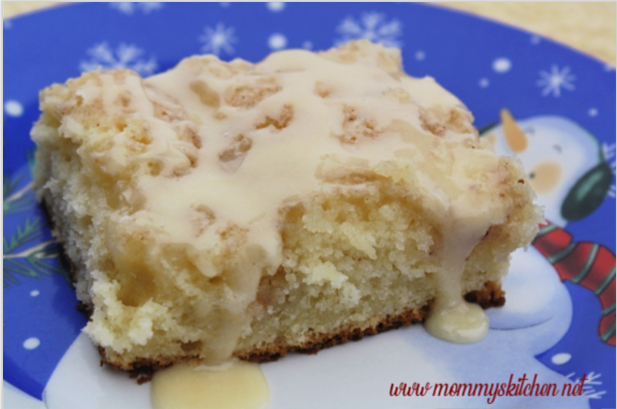 Cool 20 coffeecake for about 15 minutes and then drizzle with the eggnog glaze. To prepare glaze in a small bowl, mix 1 cup powdered sugar and 3- 4 tablespoons eggnog until creamy and smooth. You want the glaze thin enough to drizzle. Drizzle over coffee cake and serve. Looks like a wonderful recipe! Gonna make it soon! Thanks! All I need is a cup of coffee to go with this cake. So glad you posted this recipe! I forgot to get the egg nog out of the fridge for Christmas morning breakfast. Now I have a recipe to use it in. Delicious! Everyone raved about it! I am adding it to my Holiday traditions cookbook. Thanks for a new Christmas tradition! I made the egg nog coffee cake there are no words to describe how good this is everyone should at least try it. Thank you so much. That is what the orginal recipe stated. It is an overnight coffee cake. I can't answer that ? for you so you will need to ask Mandy at Mandy's Recipe Box. That is where the original recipe came from. @Jeejee letting it rest in the fridge enaybles all the flavours to mellow and really bring out all the yummy flavours of this dessert. This recipes looks amazing. I will have to make it soon. I made this with the rum extract and it was a favorite at a recent family party! Don't have the extract. Just leave it out or maybe use vanilla? Let me know what you all think. Thanks. 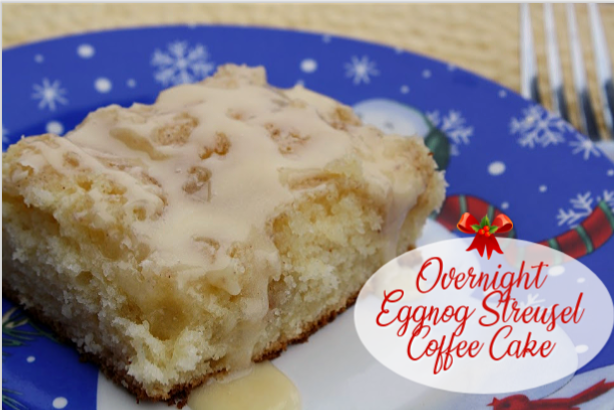 Seems to be copied exactly from "Overnight Eggnog Streusel Coffee Cake - Betty Crocker". (Comment #14) It always amazes me how someone has something to say and they post "Anonymous". Perhaps it is because they are embarrassed to leave their real name. Get your facts straight as I have credited the source of this recipe and it is not written word for word. Anonymous you are barking up the wrong tree and I hope you have a blessed day.